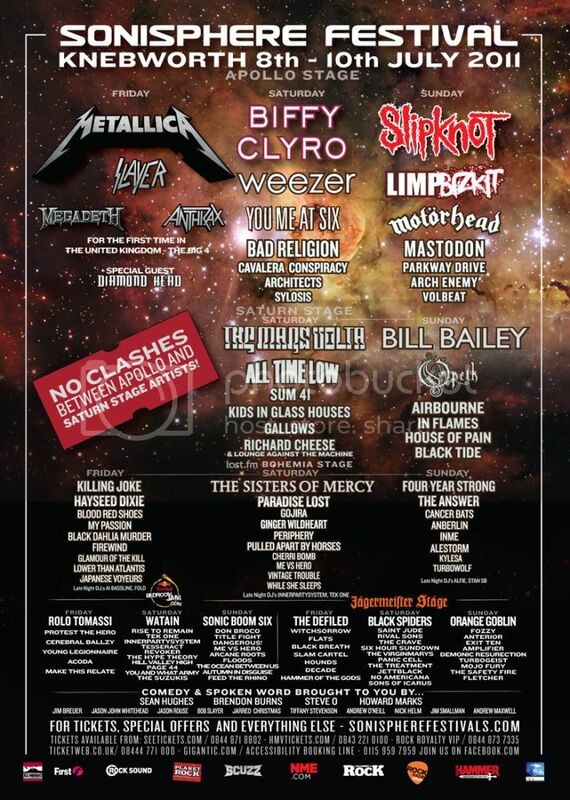 HomeNewsNEWS: Sonisphere add 24 more bands to complete the 2011 line-up! Sonisphere have added a final 24 more band’s onto the roster to complete the line-up for this year’s festival in Knebworth. The festival will see these newly added bands performing across the July weekend: Sonic Boom Six, The Defiled, Black Spiders, Anberlin, Black Breath, Blood Red Shoes, Cerebral Ballzy, Cherri Bomb, Decade, Don Broco, Exit Ten, Flats, Hammer Of The Gods, InnerPartySystem, Mojo Fury, Panic Cell, Revoker, Rival Sons, Slam Cartel, Sons Of Icarus, The Safety Fire, Turbowolf, While She Sleeps and Young Legionnaire. To see a larger version of the line-up poster above, simply click on the image. Sonisphere takes place from July 08 – 10. More information can be found at the official website by clicking here. NEWS: Slash announces headline UK tour dates for July! NEWS: Reading and Leeds Festival make Lock Up Stage additions! NEWS: Don Broco to re-release their single ‘Hold On’ and are set to record new material!